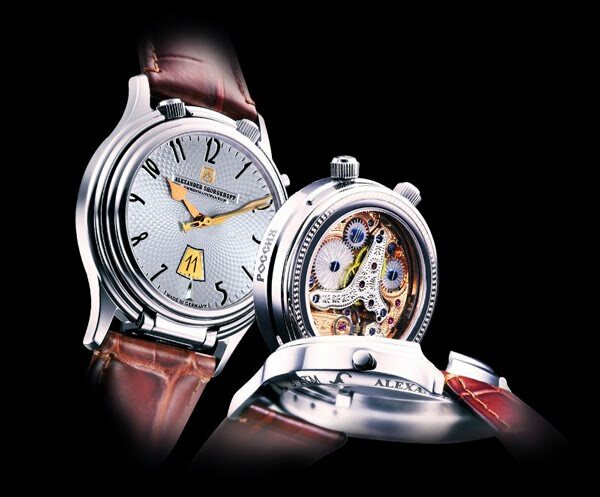 At the BASELWORLD 2012, the watch “Peter Tchaikovsky“ of the HERITAGE collection by Alexander Shorokhoff will be presented with a new function. The mechanical alarm watch Peter Tchaikovsky has been optimised in regard to legibility of the alarm display and the ring tone. At the BASELWORLD the new watch “Big Alarm“ which belongs to the HERITAGE collection will be presented for the first time. In the same manner as its predecessor this watch impresses by an elegant, classy design and the imaginative details. The stainless steel case of 40 mm diameter and with height of 11,5 mm consists of two parts and can be opened. Pushing at the button close to “2” the inner part can be lifted off with help of a clasp-mechanism and the watch can be put up and placed on a table. With one handling the wrist watch transformed into a practicable travellers‘alarm clock. The alarm function can be set with the help of a turning disk at the dial. When lifting out the inner case part, the view at the refined mechanical movement (cal. 2612.AS) will get free through the sapphire glass back. The refined and covered by special “cloud polishing2” main plate is completing the complex over-all picture. In every detail of the movement’s „inner life” you can see handmade engravings of high artistic level. The bridges of the “Peter Tchaikovsky Big Alarm” are gold or rhodium plated, the screws are blue-dyed. The watch has a water resistant of 3 atm. This model is available with leather straps in different colours and with normal steel buckles.